Certainly one of the most significant bands in West Midlands rock music history, very little has been written about them until now. Best known as the group that both Robert Plant and John Bonham played in prior to helping form Led Zeppelin, The Band of Joy story is entertaining, confusing, funny, and unfortunately sometimes tragic. Ultimately, this book tells a story of the road to incredible success for two of the band members. It's also a story dedicated to many of the people who helped them on their way. On a recent visit to Reddich town centre, I had half expected to see a bronze statue of John "Bonzo" Bonham prominently located in the pedestrian market area. Wether or not any of the busy shoppers there knew or even cared who John Bonham was is beside the point. The Led Zeppelin legacy and legend continues to grow world over so it's amazing the hometown of rock's greatest drummer pays no tribute or provides a spot for fans to gather. Is it just me... or is the local Chamber of Commerce missing out on a good opportunity here? Perhaps even more telling was my enquiry to the bartender at a nearby pub when I asked if John Bonham had drank there was answered with; "...well ...he may have been in here, but I really don't know. What are you having?" Such indifference is not shared by most rock music fans who have 'Stairway To Heaven' so thoroughly ingrained into their brains (me included) that thought of a life without the song is hard to imagine! But where did it actually all start? How can a sleepy West Midlands town have produced one of the loudest and most influential drummers in rock music history? For answers, you can explore this web site starting with The Senators, then Pat Wayne and The Beachcombers, and now, Harry Barber's book THE BAND OF JOY. The Band Of Joy's roadie, Harry Barber (who was also drummer for 1960s Brum group Paint), spent five years researching and writing The Band of Joy story - drawing from his own gig diary, collection of press cuttings, and a remarkable memory of his time on the road with the band. Each of the different line-ups is fully documented - no easy task as he says there were six distinct versions of the band during the 1960s "...and at one time, two versions with the same name at the same time"! 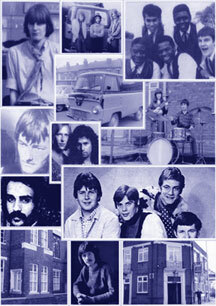 "This is the story of The Band of Joy from its start in the cafes and pubs of West Bromwich, all 8 lineups of the band with photos, newspaper clippings and my personal memories of that unique time. I just wanted to put a lot of misconceptions right. To back up my memories I have researched newspapers, talked to the band members and I had kept a record of most of the gig dates. Anyone who had anything to do with the Band of Joy is mentioned. Lineups including Robert Plant, John Bonham, Vernon Pereira, Mickey Cox, Chris Brown, Paul Lockey, Pete Robinson, Kevyn Gammon, Lyndon Laney, and more." The story begins in March of 1967 when 'The Band of Joy' was formed by vocalist Robert Plant and guitarist Vernon Pereira. The book gets right into the origins of the two principal members and the paths they had followed up to that point. Harry Barber was involved with the group from the early days and even before their formation as drummer for 'The Blues Movement 67' with whom he shared some harrowing experiences with Robert Plant. Yes, there are some good stories throughout the book of adventures 'on the road' and what it was like to be a roadie for a busy rock band in those days. Harry Barber describes each of the Band of Joy formations in detail - and he should know as he was there for all of them during the 1960s. Complex as it is, the book follows all of the line-ups - with and without Robert Plant. And yes its true, there were actually two "Bands of Joy" gigging at the same time for a few months in 1967 (this is where it really starts to get confusing!). Fortunately, Harry has all the events arranged close to chronological order with his easy-to-read writing style while somehow managing to avoid getting bogged down in details. You don't have to be a Led Zeppelin fan to like this book. Anyone who remembers the great 1960s music scene of the West Midlands or who now lives in the area will find it an interesting read. There's a lot of local history in the book - particularly places and names that are now just a distant memory to many who participated in or enjoyed the wonderful local live music scene that existed in those days. One of the highly interesting parts of the book to me is a section of "Gigs and Dates". This comprises a list of all the gigs played by The Band of Joy in 1967-68 including the venue they played at and even which particular version of the band played at which gig! This information is particularly useful for sorting out the period when two versions of the group existed at the same time. There's also a list of the songs performed by The Band of Joy - some of which will doubtless be familiar to many Robert Plant fans. Many rock music fans will be interested in the historic recording session when the Band of Joy line-up to include Robert Plant and John Bonham were captured for the first time together on record although the resulting tracks remained unreleased until many years later. No one at the time knew that half of Led Zeppelin were on that tape! Yes - this is a huge chapter of much-overlooked rock music history that we have here. As well as the various Band of Joy line-ups, details of Robert Plant's previous groups are also mentioned in the book including the mod-styled Listen (with whom he made his first record), and Obstweedle with whom he was performing at the time of his discovery by Yardbirds guitarist Jimmy Page and future Led Zeppelin manager Peter Grant. In addition, there's also an interesting section that has profiles and details of the different venues where all these bands played. Some of these include 'The Casa Bambu', 'The Halfway House', and 'Holy Joes rehearsal rooms' (West Bromwich), 'The Ship & Rainbow' (Dudley Road), and of course the famous 'Three Men in a Boat' pub in Walsall (where Slade first got together as The 'N Betweens). As well as some very funny stories, there's also tragic events detailed in the book. Band of Joy co-founder Vernon Pereira went on to form the Birmingham hard rock band 'Possessed' in the 1970s with whom Harry Barber was also employed as roadie. The band (including Pereira) was all but wiped out in a horrific car crash when on the verge of major success. John Bonham's fate is well known but those details are respectfully omitted from Harry's book. At least Harry Barber has at last succeeded in setting the record straight regarding Robert Plant and John Bonham's early bands which have in the past, according to many Led Zeppelin bios, been described as various "obscure" or "dead-end" Birmingham bands. A good part of the book is devoted to what happened with many of the various band members after The Band of Joy disbanded so this also makes for some interesting reading. The Band of Joy actually did re-form with some original members during the 1970s. Although the band was not to include either Robert Plant or John Bonham, they did tour along with recording a couple of albums. Strangely, Robert Plant's own music career has now finally come full-circle with his present day formation of a new Band of Joy and release of their self-titled album and world tour (see www.robertplant.com). 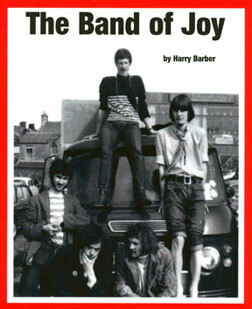 The Band of Joy book includes a good helping of vintage photos of the group - some rare and previously un-published from Harry Barber's own collection. Recent photos of pubs and former venues are in there too. There's also plenty of old newspaper cuttings reproduced as well as gig advertisements and other assorted memorabilia. In addition (for the technically-minded), there's even a list of the different instruments and amplifiers used by the band on stage. This book is probably not the last that will ever be written about The Band of Joy, but it's certainly the first. For the fans and researchers of Led Zeppelin, Harry Barber's book is now an invaluable reference regarding an important chapter in the lives of Robert Plant and John Bonham that has often been mis-represented until now. For anyone else who is interested in the pop/rock music history of the West Midlands then this book is well recommended.